Take a good look at the record board below. Phelps. Lochte. Coughlin. Grevers. Vanderkaay. Knutson. Burnett. Descenza. Tarwater. Komisarz. Some of the legends with their names up there. Smith. Bilis. Simon. Bartholomew. NCAA stars who will meet again in March. The Georgia Tech Campus Aquatic Center has seen greatness, but there is a big storm coming: the NCAA Championships. What records are safe? Which pool marks will be absolutely smashed? How will the upcoming men’s and women’s NCAA Champs re-shape this legendary record board? We’ve already posted the women’s pool record watch, and now we’ll take a look at the shake down for the NCAA men. Texas showed everyone who’s boss last year, their insane depth and talent sending a booming message after they put up six A finalists in the 100 butterfly. Jack Conger and Joe Schooling popped out incredible swims every time they dove into the pool (including a 40.9 relay anchor for Conger and 19.9/43.9 fly splits for Schooling, plus Schooling and Conger 1-2’ing both butterfly events), while Will Licon de-throned favorites Chase Kalisz and Kevin Cordes in the 400 IM and 200 breast, respectively. Clark Smith got his name in the win column, too, taking the 500 free as the only competitor hopping the 4:10 barrier. Texas won two relays and finished 3rd, 4th, and 8th in the other three. We’d go over the list, event-by-event, of pool records that were broken last year, but it’s easier to put it this way: except for David Boudia’s platform diving record, every single event ended with a new pool record. That goes for individual swims of all strokes and distances, for both of the other diving events, and for all of the relays. Looking back, David Nolan‘s 200 IM win might have been the swim of the meet. Going out in an incomprehensible 45.99, Nolan out-split Ryan Murphy on the backstroke, tied Will Licon for the fastest fly split, had the 2nd fastest breast split, and then again had the fastest split on the final 50 free. His amazing 1:39.38 took down all of the big records, besting even LCM World Record holder Ryan Lochte in his swim. Cal’s Murphy, though, torched the field in the backstroke events. His 44.21 in the 100 neared Nick Thoman‘s American record, while he took Lochte out of the books (this was a tough meet for Lochte’s name) in the 200 back with a stellar 1:36.77 to win and make himself the fastest ever in that event. The young guns were on fire, as Florida freshman Caeleb Dressel beat out Kristian Gkolomeev for the 50 free title (18.67) and came within a hundredth of Nathan Adrian‘s American record. Texas was the big winner in the end, their 528 points making them the only team to top 400 points. Cal settled for 2nd at 399, while Michigan grabbed 3rd with 312. Without further ado, let’s get into our predictions for how the Georgia Tech pool record board will fare against the field of the 2016 Men’s NCAA Championships. The Butterflies — no way can these marks withstand the inevitable heat from Texas studs Conger and Schooling. They were both well under :45 in the 100 and 1:40 in the 200 last season, and there’s no reason to doubt that they will be back to swim that fast (or faster) again. You can’t sleep on Michigan senior Dylan Bosch here, who holds the NCAA record at 1:39.33 (a record Conger would have if his 1:39.31 wasn’t done in a time trial). Andrew Seliskar is a wild card here– he might find an easier path to more points in the 200 breast, but he’s already been 1:44.1 this year, which ranks third in the nation closely behind Schooling and Conger. The Backstrokes — just like with Schooling and Conger, you can’t really doubt the heat that will be brought by Ryan Murphy. The 100 seems all but in the bag for Murphy, and while the 200 is going to be close, the American record holder in the 200 back is, well, the American record holder. He’s swum incredibly fast already this season (1:41.35!) and has his eyes on the prize. It’s hard to consider anyone who might have the talent to beat Murphy, but Jack Blyzinskyj of Florida is tied with him for the fastest 100 back time this year (46.21) and Sean Lehane (Tennessee) and Carter Griffin (Mizzou) are coming off very hot summers in the 200 back. Texas works in here in the form of freshman Ryan Harty, who’s already been 1:42.52 this year in the 200. The Breaststrokes — No more Cordes, but last year Licon proved that the man is beatable. The 200 breast record is waiting to get smashed, and the 100 record is going to get edged, too. Last year, seven of the eight A finalists in the 100 were seniors. The only returner is Fabian Schwingenschlogl, who transferred from WKU to Mizzou since last year’s meet. Schwingenschlogl finished 6th at 51.66, under Alexandrov’s GA Tech pool record. Peter Kropp has already blasted a 52.13 this year, while Peter Stevens, Jason Coombs, Carlos Claverie and Michael Duderstadt are all in the mix. There’s no clear favorite, especially at this point in the season, but it’s a safe bet that whoever ends up on top will set a new pool record in the 100, and Licon looks to have the 200 locked up. 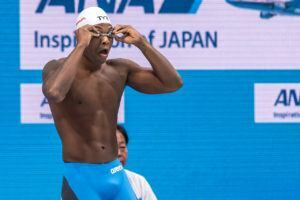 The Sprint Freestyles — Dressel and Gkolomeev meet again, and Simonas Bilis would like everyone to know that he’ll be joining this party. Bilis erupted for a 18.96 anchor leg in NC State’s medley relay loss to Texas at their dual meet on November 14th. Dressel and Gkolomeev were both under Grevers’ record last year, while Gkolomeev dipped below Copeland’s record in the 100. Bilis, meanwhile, touched 2nd to Gkolomeev in the 100 (41.78) and tied the since-graduated Brad Tandy at 18.91 for 3rd in the 50. 1000 Free — Last year, Michigan’s PJ Ransford flipped at 8:46.40 in the 1650, and ended up finishing 2nd overall to Matias Koski. The Wolverine freshman was well under the mark of 8:48.03 set by Sébastien Rouault in 2006. Koski and Ransford will both be back this year, but NC State sophomore Anton Ipsen has been scary good already this year. He leads the NCAA in the 500 through the mile, and he threw down an 8:55.99 against Texas on November 14th. 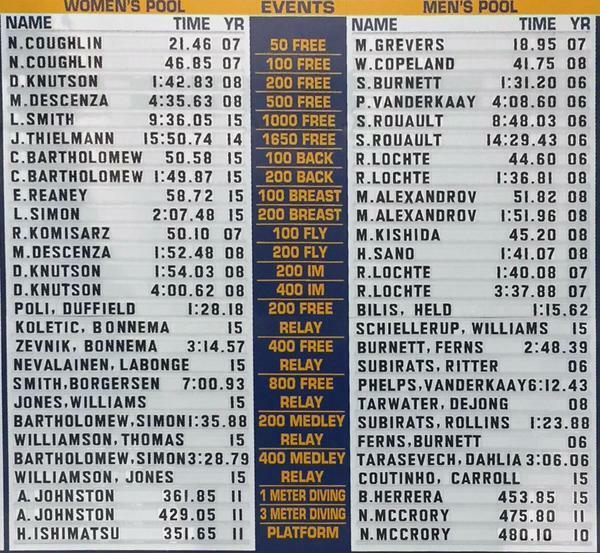 Like the 100 breaststroke, there are a lot of players in the mix here, but that record should bite the dust next spring. Texas’ Clark Smith put down an 8:52 in the first 1000 of his 2000 free at the Eddie Reese Invite (read more about that here), and while he swam the 200 fly on the final day of NCAAs last year, he’s certainly a player here. 400 IM — Sorry, Lochte. It won’t be Nolan, nor Murphy, but Will Licon is coming. Licon surprised Chase Kalisz last season, posting a 3:36.37 to win the NCAA title. Licon won’t be alone, as Gunnar Bentz and Josh Prenot will be back and fighting. We don’t know the versatile Seliskar’s schedule yet, but he went something to the tune of 3:37.52 last spring at the PV Senior Championships, and could factor in here as well. The Medley Relays — Cal and Texas will be the warriors in the medleys. Freshmen are key here; Seliskar should slide into Katis’ vacant breast legs for Cal, while Harty will do the same for Texas on back. 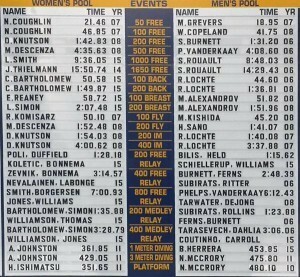 The remaining members of both relays for both teams return, save for the graduated Seth Stubblefield on Cal’s 400. Tyler Messerschmidt will be a capable replacement on the anchor leg. Both of these records will be blown right out of the natatorium. While Texas and Cal will be the seasoned veterans here, Alabama could play spoiler in the 200. They finished 2nd behind Texas last season, and return all four of their members. 500 free — Peter Vanderkaay owns this record with a 4:08.60 from 2006. Clark Smith is rising, but will he be game to knock down this big one? Smith, remember, was the sole swimmer to break 4:10 last year. His 4:09.72 last year was magical, but losing another second and some change might prove to be too much. He’s got a very legitimate training partner this year in freshman Townley Haas, who could develop the speed for a sub-4:10 swim, but in the least will push Smith in practice. Ipsen is the top ranked 500 freestyler so far this year, but his strength grows the longer he’s racing. It’s tough to call. 200 IM — Mr. Lochte, you MIGHT be safe. But it’ll be close. 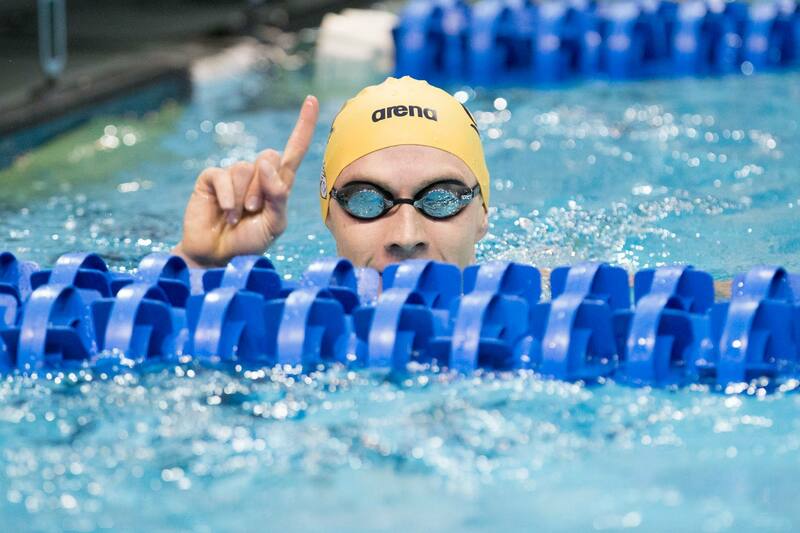 Lost in the David Nolan-1:39-he’s not real-mayhem, Will Licon sneakily swam to a 1:40.09, just a hundredth off of Lochte’s old American record (which he set here, at GA Tech). He hasn’t beaten Lochte yet, but he’s DARN close. The question will be whether or not someone can push him. None of the Cal trio (Prenot, Seliskar, Murphy) has ever been under 1:41-mid, but one of them might be able to race neck-and-neck with Licon. It’ll be interesting to see if Gunnar Bentz or Joe Schooling can find the speed in this event, too. We can’t forget about Jan Switkowski, either. The Florida Gator, who transferred this year from VA Tech, blasted the nation-leading time of 1:45.07 in UF’s win over South Carolina. 1650 free — Much like the 1000, it’s not too clear who is expected to take the cake here. But Rouault’s 14:29.43 is definitely in reach. Koski was less than three seconds away from this record last year, with Ransford a couple seconds back. Ipsen, with the way he’s been swimming this year, is getting ready to explode. Sub-14:30 might be a stretch, but there are capable swimmers out there this year. Again, if Clark Smith decides to swim this over the 200 fly, we must note that he split a 14:34 at the mile mark of his 2000 free at the Eddie Reese Invite. The Free Relays — Last year, USC was dominant in the 400 and 800 free relays, while Texas owned the 200 free relay. USC lost a lot of talent to graduation and red-shirting and Texas lost a leg of their 200 free relay to graduation, though, and these records are no joke. NC State lost David Williams from their pool record-setting relay last season, but Joe Bonk (another VA Tech transfer) is a solid reinforcement. Texas could opt to put Schooling on their 200 free relay, but NC State still looks to be the favorite this year for that race. They’ve been battle-tested, and it’s way too fun to root for them to take the win after winning last year only to find out they had been DQ’d. It’ll be really close with their own relay record, especially as Bonk comes in with less speed than Williams left with. 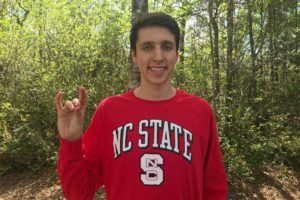 NC State has catapulted themselves to the top tier of the NCAA in a very short time, and this year, they have all the pieces to take all of the free relays. They were runners-up in the 400 free relay by just eight hundredths, but USC won’t be quite as strong this year without Dylan Carter, Santo Condorelli, and Quintero. Cal and Texas were essentially non-factors in the 400, as both were over a second back from NC State. Bonk will likely replace Williams again on this relay. The 800 free, meanwhile, is a Phelps record. 6:12 is doable, however. The USC relay broke that last year but doesn’t return the kind of talent they had in 2014-15. NC State was 5 hundredths shy, and despite losing Williams (their fastest split at 1:32.51), freshman Justin Ress might be the right replacement. He’s already been 1:37.25 this year, ranking him in the top 16 in the nation. 200 free — Simon Burnett‘s mark of 1:31.20 is the fastest SCY 200 free ever done. Sorry, but there’s nobody around this year to scare this one. Only two guys got under 1:33 last season, Cristian Quintero and Anders Nielsen. Quintero has graduated, and Nielsen hovered around 1:32.8 in prelims and finals. Blake Pieroni and Townley Haas are two young guns coming off of great summers, but a 1:31.20? That’s next level. We’re not there yet. That wraps things up– disagree with one of our predictions? Let us know in the comments how you think the record watch will play out come NCAAs. Today blanked on Smith since he did the 200 fly last year instead of the mile. I put him in there– he could definitely top the field in the mile if he focuses on that this year.